Reports of defections among Syrian security personnel are raising questions about how well the leadership can control the moral, religious and political factors influencing people in the country. 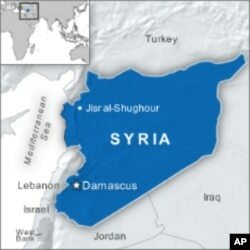 Elite forces of Syria's security apparatus are said to be converging on the town of Jisr al-Shughour, in the aftermath of what the government says was the ambush and killing of 120 of its forces by "armed gangs." But witnesses in the region counter the official report, saying that the victims included soldiers who balked at orders to open fire on protesters, and were killed by government loyalists. Human Rights Watch researcher Nadim Houry says it is very hard to confirm these reports, because Jisr al-Shughour has been largely cut off from the rest of the world and access to residents who fled to neighboring Turkey has been restricted. But he says there have been precedents. "Based on what we've seen in other towns where we have managed to do a lot more research, in southern Syria, in Daraa, for example, we know there have been some defections and in some cases some soldiers have come under fire from the security forces for defecting," said Houry. Political observers believe some of these soldiers may have been shocked when they encountered ordinary people, rather than the thugs and terrorists the government said were behind the unrest. Abdelaziz Sager is the chairman of the Gulf Research Center in Jeddah, Saudi Arabia. "The government may have deceived the people by not really providing the real information on security officers being directly involved and so it happened to be innocent people, peaceful demonstrations where people were demanding real, legitimate demands and they saw the oppression the government decided to use against them. This may be an important element [that] made them decide," said Sager. For rank-and-file soldiers, those protesters are often very much like themselves, from middle, to lower-middle income families, with no connection to the minority Shi'ite Allawite leadership of the mainly Sunni country. According to political analyst Sager, this collapse in keeping the country firmly under the control of the ruling Assad family can be pinned on the current generation led by President Bashar al-Assad. Sager argues that the president's father, Hafez al-Assad, rallied Sunnis and even Christians under the Baath political banner of Arab nationalism - while also employing massive oppression. The current Assads have had to fall back on just oppression, but how far to use that, according to Sager, is a matter of debate and nervousness within what he calls "the family business." "Some may want to go for reforms," he said. "Others may believe if you do reform, this is it, this will lead only to much more deterioration and more concessions. Others believe using a strong force, using the security method may work better and this is what we have seen now in the divisions and diversity between the approaches that each one with his background and his character is playing things. But, in the end, both know they are all losers. In the end, they know they lose - they all lose." The continued protests in the face of the brutal crackdown - human rights observers believe some 1,300 people have been killed in the past three months - would seem to indicate the Assad family's options are becoming increasingly limited. "The main factor for the government crackdown has been anyone protesting against the government or anyone who's not towing the line completely," said Human Rights Watch researcher Nadim Houry. The risk of such a blunt tactic is that it only creates more opposition to the government, as the recent defections in the security forces appear to signal.